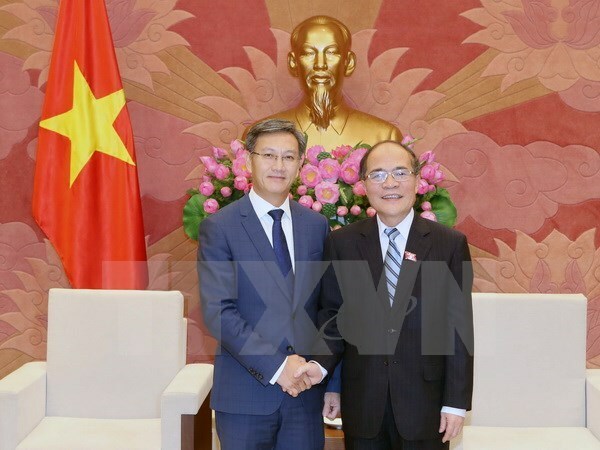 Hanoi (VNA) – National Assembly Chairman Nguyen Sinh Hung welcomed newly-accredited Lao Ambassador Thongsavanh Phomvihane in Hanoi on November 27, during which he hoped that the diplomat would contribute to further enhancing bilateral ties. He praised Laos' accomplishment in its nation building efforts, while reaffirming that bilateral relations between the two countries remain a key priority for Vietnam. The ambassador expressed his honour to undertake the task of working in Vietnam.